CAMELOT CASTLE - la vostra destinazione da sogno. modo per concludere la giornata !! Freccette elettroniche, Play-In Castello e TV, lettore DVD e videoregistratore. essere lì! Ultime Virtual Tour fotografato nel gennaio 2006. Urbane, interurbane e chiamate internazionali. scheda telefonica o utilizzare il proprio telefono cellulare! sono fuori di questo mondo! di uccelli roost. L'airone residente e garzette sono una gioia per gli occhi. Raggi dalla mattina presto fino al tramonto. godere Pool, Biliardino, freccette elettroniche e quoits. I nostri ospiti godono anche uso illimitato dei seguenti elementi: ~~ Gratuito Long Distance e le chiamate locali in America e Canada ~~ Gratuiti telefonate internazionali in oltre 100 paesi ~~ Computer con accesso ad internet wireless ad alta velocità 24/7 ~~ 7 'Pool, Biliardino e freccette elettroniche ~~ MegaBlocks Gioca-in-Castello in Sala giochi ~~ tutte le lenzuola (minimo 2 set per letto) ~~ teli da bagno, asciugamani da bagno, asciugamani e lavare panni ~~ Canne da pesca ~~ 50 'DLP HDTV con canali ad alta definizione ~~ 4 x TV via cavo ~~ TV, DVD e videoregistratore, più DVD e video in sala giochi ~~ radiosveglia 4 x ~~ 5 x Asciugacapelli ~~ 5 x lettore DVD / CD più DVD ~~ 4 x Phones (2 x cordless - chattare con gli amici e salotto a bordo piscina) ~~ Segreteria telefonica Telefono ~~ 2 x Stereo sistema / CD ~~ Sony Playstation 1 ~~ Sony Playstation 2 ~~ Giocattoli, Giochi di società, giochi gonfiabili Piscina, Libri ~~ 10 lussuosamente imbottiti verticali sdraio / sedie piscina ~~ 4 lettini lussuosamente imbottiti ~~ teli piscina di lusso (16) ~~ Pool asciugamano supporto ~~ Copertura Pool sul rullo ~~ Pack'n'play Viaggi culla e biancheria da letto ~~ Seggiolone ~~ Cancello bambino Stair ~~ Baby monitor ~~ Child bed & Winnie Pooh la biancheria da letto (per un massimo di 6 anni) PLUS ~~ Elettronica Serratura porta - senza bisogno di chiavi o il check-in ad un ufficio - andare direttamente al Castello di Camelot. ~~ Top della gamma di apparecchi di cucina e lavanderia. ~~ Ventilatori a soffitto in salotto, camera familiare e tutte le camere. ~~ Porta del garage automatica. ~~ Monitorati sistema di allarme di sicurezza. This home is very close to all the major Kissimmee attractions but also a step removed from I4 congestion. It is in a quiet and peaceful neighborhood with a lovely view of the lake and the wildlife in the area. The owners are very quick to respond to any questions or concerns and truly do their best to make your stay a good one. They provide precise instructions on details for caring for the house and are very generous in allowing their guests to adjust the pool heat to our comfort level. They also share their tips on local restaurants and shows which was appreciated. We spent a week there and say thumbs up! Overall the house was pretty much as shown in the profile. Really enjoyed our time, subdivision was very quiet and the lake at the rear of the property provided a lot of privacy. Pool was nicely heated but starting to show some signs of age and was large enough for our family, hot tub was a bonus but temperature was cooler than pool on arrival. Rooms were clean and kitchen was well equipped. Overall a good experience. We stayed at the Camelot castle for two weeks in August 2018. First impressions when we parked at the villa were good, but it only got better when we walked in. The villa is very well equipped, we honestly had everything and more than we needed. So much space, tasteful furniture and decor, the games room.. beds were really big and comfortable, bathrooms so luxurious. But the highlight of our stay was the view behind the villa. From the pool and the hottub we watched birds and butterflies on this beautiful and peaceful lake. 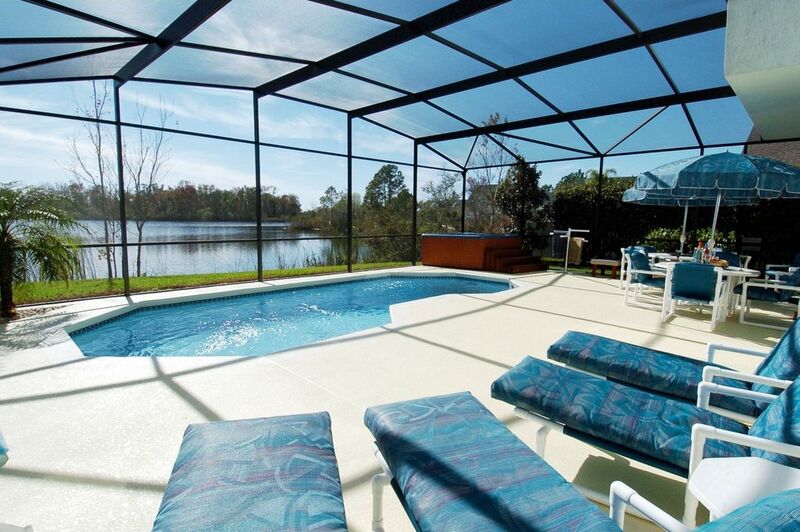 The villa is in a great location, about 25 minutes from Universal and Disney parks. We also went to Kennedys Space centre which was about 1-1.5 hours from the villa and it was certainly worth to visit. Medieval nights was another really worthy evening, good meal, beautiful horses and fantastic atmosphere. We thouroghly enjoyed our stay at Camelot castle and would definitely stay again if visiting Orlando. We will not hesitate to recommend to others. Thank you Daoud for letting us stay in your lovely castle. Thank you very much for booking Camelot Castle and we greatly appreciate your time submitting the wonderful review and recommendation. Looking forward to having you as our repeat guests if you visit Orlando again. Property is exactly as advertised. Very comfortable accomodations, great back yard, pool, view of lake. Neighborhood is a little bit dated with some run down homes, but likely just because it's mostly rental / part time homes. Location is convenient to great golf, Disney and Universal with good access for shopping nearby. We had a couple of maintenance issues which the owner quickly resolved with management company. We would definitely recommend and will likely stay again! We were very comfortable at Camelot. The property was well described and did not disappoint. We only had one minor hiccup, the washer was not functioning properly, but they brought us extra towels to help make our stay more comfortable. Excellent property for a family vacation. Vi har haft en rigtig dejlig ferie i huset, som ligger i et roligt kvarter med en fantastisk dejlig udsigt ud over søen. Vi havde meget glæde af terrasseområdet med pool, spa og fint udstyr af borde, stole og liggestole. Huset er stort og veludstyret, så vi har bestemt ikke manglet noget. Thank you very much for booking Camelot Castle and your great review. Hope to have back as our repeat guest! Passeggiate naturalistiche nella conservazione dei Mille Oaks bosco. Nightly Rate: $150- $250 Weekly Rate: $1050 - $1750 Monthly Rate: $1600 - $2400 Per week from: US $1600 Deposit: US $500 Pool heating (electric): included year round Hot tub heating: included year round Sales & Tourist tax: 12%. All payments in US$ via VISA or MasterCard credit cards. Mid-stay cleans available at extra cost . Book locally. No Pets Smoking on deck area only, please.